I have not been able to figure out where this venerable old trick came from or who invented it. I have found catalog advertisements for it dating back to the 1940's, but no inventor's name has ever been mentioned. The original Four Card Monte effect still plays very well and fools audiences today, so Ill show you an old version that I was using back in the 1960s with Rabbits and Top Hats, being used by today's Wiz Kid Rider in Wiz Kid shows. One of the flaws I found with the original version was not being able to show both sides of all the cards. Wiz Kid Rider demonstrates a special series of moves I combined together that allows him to show both sides of all the cards at the beginning and end of the routine. 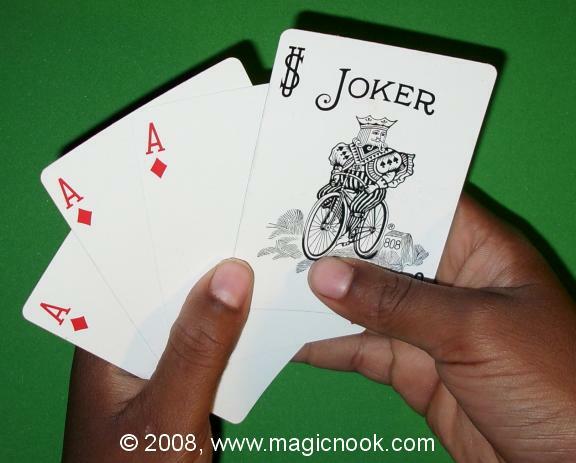 I will also provide you with other options so you can make your own versions of this trick in either Jumbo Size for stage presentations, or regular playing card size for close-up. 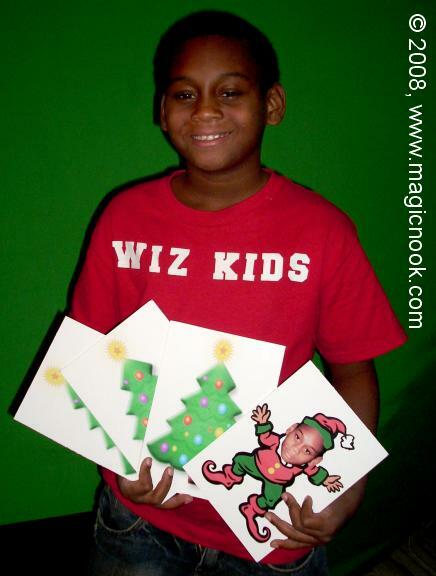 Just print out the cards from the templates I provide in the e-Book, or make up your own from playing cards. Wiz Kid Rider also uses a special card gimmicked as in my "Talking Greeting Cards" effect so the Rabbit can talk to the audience when it reappears at the end of the routine. You would need to get that effect if you want to make one of your cards "talk." Wiz Kid Rider also came up with a new move that greatly improves the Four Card Monte by having the different card (in the above example, it is Rider himself as a Christmas Elf ) suddenly appear after the cards are shown front and back. 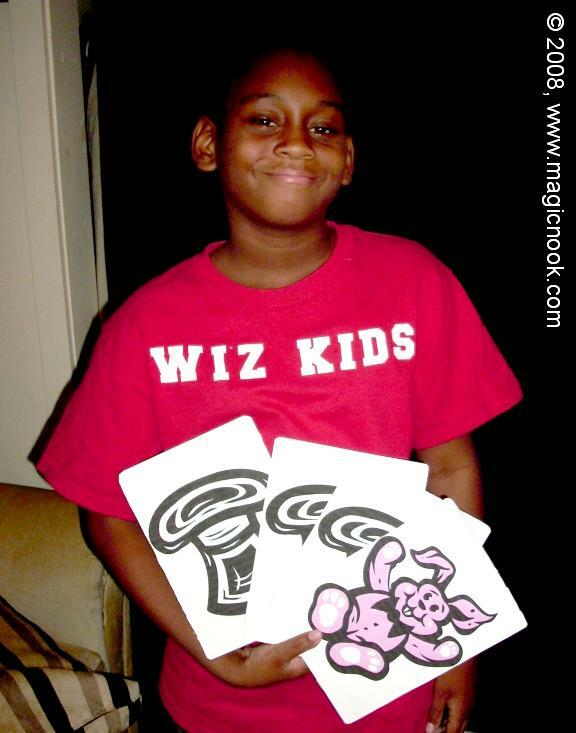 You can see Rider's cousin Wik Kid Qua-Fiki using his new move in "The Three Little Pigs." The templates for the cards shown above are included with the e-Book for those who want to use the Christmas Theme with a personalized card like the one Rider is showing. WJ17-00 COMPLETE - all 224 Pages!